Iain McCaig has been creating art for movies for a long time. This book contains illustrations created for Star Wars prequel, Harry Potter and his concept art for other projects. Most of his work belong to the fantasy genre. In this book, a fictional interviewer called Bryon is created to introduce readers to the artwork and bring them into Iain McCaig's imaginative world. It's pretty amusing and reads like some fantasy adventure. My minor quibble would be there isn't a biography of his illustrious career. Insight Editions is the publisher of this thick and big book at 240 pages. It's hardcover with a beautiful matte dust jacket. There are plenty of glorious concept art, mainly character designs, paintings and sketches. Each is reproduced brilliantly on the glossy paper, showing intricate details of ink, pencil or colour strokes as well as the texture of the medium. While there are digital paintings, most of the illustrations featured are done using traditional medium, showing texture and grain. The large pages enhance the viewing pleasure. 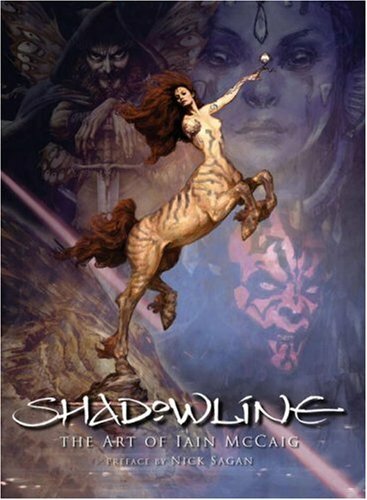 This book is highly recommended to fans of Iain McCaig, fantasy artists, concept artists and character designers. It's very inspiring and overflows with creativity. Darn ! I want !!! haha. I love Iain's work, especially his earlier stuff on the Fighting Fantasy gamebook covers. Does this book have any of that work in there, or is it mainly the later film stuff? Many thanks. There are only 2 pages for Fighting Fantasy. They are black and white ink drawings which don't look like covers to me. The rest of the book is mainly art he did for movies and other publications.